U.S. Announces Moratorium On New Coal Leases On Federal Lands : The Two-Way The change won't affect existing leases, which generated nearly $1.3 billion for the federal government's coal program last year. The federal government will stop issuing new coal leases on some 570 million acres of federal land, under a new plan being released Friday. In this photo from 2013, coal is loaded onto a truck at a mine built on federally controlled land in Montana. Citing concerns over pricing and pollution, the Obama administration on Friday unveiled a moratorium on new coal leases on federal lands. The change won't affect existing leases, which generated nearly $1.3 billion for the government last year. The Department of the Interior says it wants to make sure the money it's charging for coal leases takes into account both market prices and what's often called the "social costs" of coal — its impact on climate change and public health. 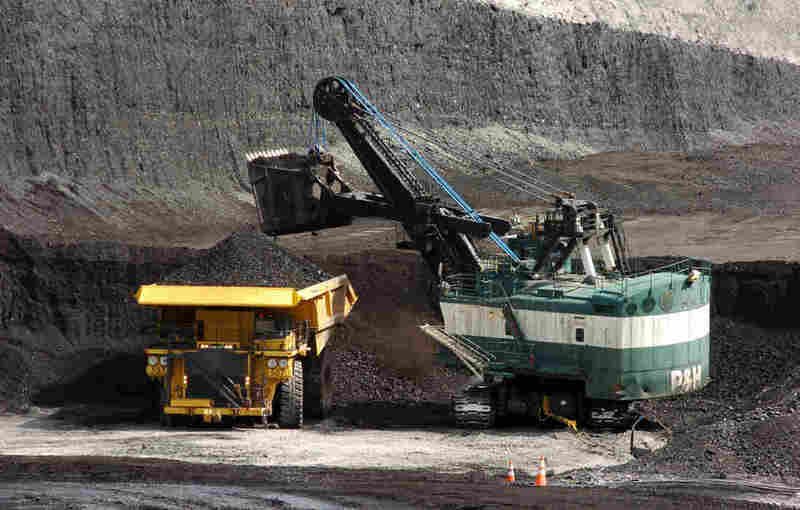 The agency says federal lands account for roughly 40 percent of all U.S. coal production. "The moratorium will remain in place while the agency reviews whether fees charged to mining companies provides a fair return and considers coal's effect on the environment. Leases already awarded are not affected." As you would expect, there are vastly different reactions to the announcement. We'll excerpt two here. "The president is right to stop this handout to big coal companies, which has cost American taxpayers more than $30 billion over the past three decades." "This unprecedented action will completely shut down coal leasing on Federal lands and will disproportionately harm the poorest among us." The review process is expected to take about three years. Secretary of the Interior Sally Jewell announced the change in a conference call Friday morning. Before that call, an administration official confirmed details of the plan to Jeff. During what her agency is calling a "pause" in issuing leases, Jewell said Friday, "we'll make accommodations in the event of emergency circumstances to ensure this pause will have no material impact on the nation's ability to meet its power generation needs." In addition to analyzing the return American taxpayers are earning on the use of natural resources, the Interior Department says it'll also review coal's public health impacts. The federal Bureau of Land Management handles coal leasing on the approximately 570 million acres of land. In 2014, 475,171 of those acres were covered by leases, along with one sale. The federal shift on coal leases comes weeks after the BLM announced that in 2015, its coal program had taken in about $1.29 billion in royalties, rents and bonuses. That's from a release in which the agency celebrated "major gains in 2015 ensuring safe and responsible energy development on public lands." Last spring, Jewell called for a new discussion of the federal coal program, focusing on the fairness of prices charged for coal leases and other concerns at five public meetings. The U.S. government shares coal-lease revenue with the states where the land is located. In recent years, that has meant hundreds of millions of dollars for Wyoming, which accounts for the most acreage and leases in the federal system and is the nation's leading coal producer. In 2014, the most recent year with complete data, Wyoming received more than $555 million in royalties and revenues, with more than 200,000 acres covered by 102 federal leases. Colorado and Utah are the next-largest participants, with more than 80,000 acres.